allows the climber to move around efficiently using the classic prusik/pulley system technique. When climbing with the ZigZag at the Petzl workshop at TCIA in Baltimore, I was amazed at how smooth and easy it was. This will change double rope climbing. The ZigZag combines the benefits of a pulley, swivel and friction bars to create an awesome climbing tool. The linked friction bars and pulley provide a smooth, secure ascent and descent system. When ascending, the climbing line slides easily through the ZigZag, with little slack tending required. Limb walking and descent is simple by pressing on the release lever, varying pressure to control descent. When released the ZigZag grabs the line securely with almost no sit back. 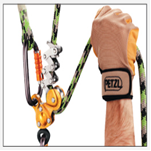 Petzl innovation, Petzl quality, in stock at Pinnacle Arborist Supplies. Visit us online at pinnaclearboristsupplies.com or call us at (501) 663-8733. We are excited about this new product and are happy to offer it to you. This entry was posted in Arborist, Tree Climbing Gear, Tree Climbing Tools and tagged climbing tools, Petzl ZigZag, tree climbing equipment, Tree Climbing Tools, ZigZag. Bookmark the permalink.